It's about anything and everything. It's the stuff that makes me smile. It's the stuff that gets me pumped to DO, to BE, to LIVE. t's about anything and everything. The stuff that makes you smile. The stuff that get's you pumped to DO, BE, LIVE. 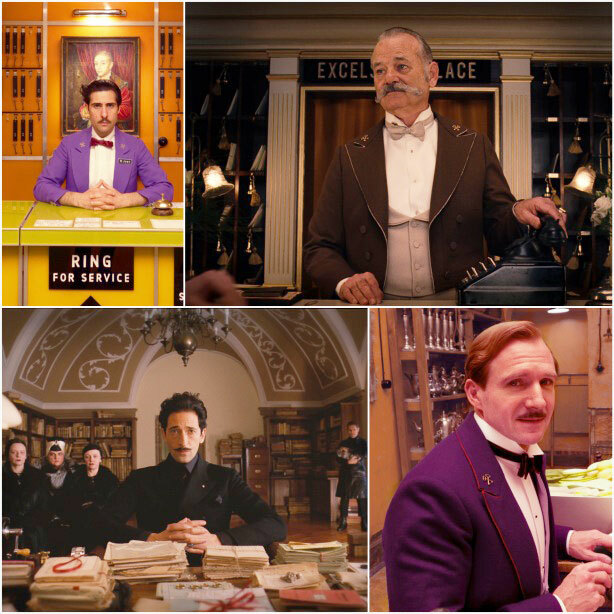 Over the past weekend I saw Wes Anderson's latest film, the Grand Budapest Hotel. Before I proceed, let me preface by saying that I don't normally watch a movie and then feel the need to go and blog about it. I love watching films, but I usually find the goods ones to be no more, no less than a really great piece of storytelling, peppered with attractive faces, hot bods, and cool cinematography. But this film, for whatever reason, did a complete number on me. I was pretty much giddy through the entire duration. I adore his work. I think of him as one of the most prolific, creative artists of our century. Notice how I didn't say: prolific, creative filmmakers. Nope. I said artists. In fact, I've plonked him in the category of "All Great Artists", among the Rembrandts, Carravaggios, Boteros, and de Koonings of our world. "How bold! ", you might say.....how does this 40 something Texan, deserve such a place in the Grand Artistic Hall of Fame? Oh, methinks he deserves it. I'm not professing to be an expert by any means, but my experience and education make me feel competent enough to back this statement up if I needed to, and this blogpost is an attempt to do just that. • Someone who breaks new ground and goes against the tide. (Wes Anderson? Check.) Among all the Ron Howards, Scorseses, Spielbergs and Tarantinos, comes a voice that is uniquely its own. The story, the telling of the story, the look, the feel, the design of the film - all of it is so very, definitely, Wes Anderson. • Someone who enables us to transform our perception. (Check.) Just watch the movie if you don't believe me. • Someone who creates an unforgettable experience. (Check.) Again, watch the movie. • Someone who sparks curiosity and inspiration within us. (Check.) I'm talking about the kind of inspiration that changes the way you think....the kind that makes you itch to create something matched in its beauty and inspiration. Personally, I haven't felt this level of inspiration from a work of art in, well, forever. Now, that's inspiration! • Someone who takes the magical and makes it tangible. (Check.) A genius artist is someone who tirelessly, diligently, habitually, works on his craft to make the vision in his head a tangible reality. Just imagine how painstakingly he plans and executes every shot. It kinda makes my head spin. • Someone who can provoke strong emotions. (Check.) Did I mention that I came out of the movie crying? Do you know how you can tell if a movie is great? It's during those inflight moments when a movie is playing on the airplane and you don't have your earphones handy. If the movie inspires you to scramble to get them or settle for watching the entire thing without sound - I think it's a pretty good guess that it's a great one. If that movie is playing without sound...and you'd rather keep reading your Kobo or take a nap - it's safe to say that you're not being captivated enough to want to watch. Imagine for a second, watching TGBH with the sound off. I'm guessing there would be a mad scramble for those earphones. I'm also willing to bet that a soundless version would be pretty darn lovely, regardless. Every shot is a masterful feast for the eyes, brilliantly composed, much like how an artist composes a painting. So why do I feel such passion about his latest? Quite simply, because I walked out of the film utterly moved and inspired....by the color, the design, the artistry, the brilliance, the story. I could go on about this, but everyone's busy these days.....so instead I came up with a top ten list. 1. Every shot was eye candy. First and foremost. I'm a visual person, so when things appeal to my eye it tends to put me into a very happy state of wonder. There was nothing out of place in this film. There was nothing that should not have been there, or that "oh well!" happened to end up in the shot. Everything was meticulously considered and placed. Connecting the dots from head to head makes a dynamic shape in the composition. Yes, here comes the nerd! Nope, nothing out of place here. When you look at the shots above, it becomes obvious just how meticulous Wes Anderson can be with each detail. Right down to the color; the angle, pose and proximity of the figures and their placement based on height; the lighting; the prop styling, etc. All things are considered. He's an incredible story teller. And the best thing about his stories is that they masquerade as being simple. There are emotionally charged undercurrents to each of his films. And any content which is edgy, macabre, or emotionally heavy, is disguised with whimsy. (Might I remind one of the missing fingers??) This film, was by far the most moving and touching yet. I did mention I cried, right? Ralph Fiennes, Jeff Goldblum, Adrien Brody, Jason Schwartzman, Jude Law, Tilda Swinton, Ed Norton, Bill Murray, Willem Dafoe, Harvey Keitel, Owen Wilson, F. Murray Abraham (OMG...Salieri! ), etc. Not since Fellini, has there been a cast of characters so unconventional in their beauty. It's an understatement to say that Wes Anderson doesn't go for the conventional, 'Hollywood' ideal of perfection. He spins 180 from there. In fact, I think it's safe to say that he deliberately seeks the quirky, odd, and unique. I adore the refreshing quality of this. Each face is of it's own unique design, much like the film itself. image courtesy of Esquire Magazine. To read up on the various styles click on the image. 7. Someone in the film is named Zero. The character played by Ralph Fiennes, is a lovely man, filled with grace, composure, kindness, and politesse. And in the face of life's disturbances, he still remains gracefully, lovely. This is the main reason why I think of him as one of the greats. Sure, his shots can seem somewhat formulaic, compositionally speaking - he likes what he likes, he knows what works, and he consistently sticks with it. But isn't it genius regardless? How many filmmakers use design in the way that he does, unfettered in it's consistency, rich in it's style and design? Few. In this film, each frame is a work of art that would translate beautifully, framed on a living room wall. I'll leave you with this piece of yumminess. The recipe and directions on how to make those cute little Mendel's cakes. Soon on the do to list will be making these bad boys. Stay tuned to see how that goes. OK....how many filmmakers actually include recipes in their repertoire???? Just saying. And now, I've got to put this great inspiration to use. Off to the studio!